" a perfect hideaway in the center of seminyak "
Well-situated in the heart of Seminyak, the most fanciful and fashionable area in Kuta. Only 15 minutes from Bali's international airport, just within walking distance to fine restaurants, shops and boutiques but tucked in the private setting and a real hideaway. The cozy arrangement of seventeen villas in Desamuda Village is designed in Modern Balinese style with 'alang-alang' roof. Nestled among luscious tropical gardens, each villa offers you a feeling of being home away from your home, even the birds and squirrels around here choose to reside in our trees. Desamuda Village provide a real home for you and your precious children in the bosom of safe and friendly environment. 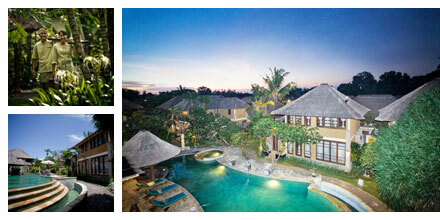 Comprised of seventeen villas which will be suited for both short and long stay. Each villa is private and self-contained and designed with warm living room with satellite TV, CD/VCD/DVD Player, and International Direct Dialing telephone. The spacious air-conditioned studio apartment is appointed with a Balinese-style double-bed or twin-bed to give you the best comfort. Living room and fully equipped pantry are the standards of this studio. A Private pool is only provided in the 1st Floor Studio. 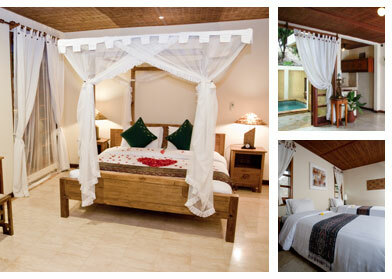 The Two Bedrooms Villa is arranged with a bedroom on both 1st floor and 2nd floor. Clean and comfortable bedrooms with a unique bath tube in the bathroom, dining room with fully-equipped kitchen and refrigerator. 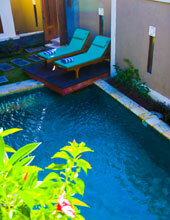 A Private pool is the standard of this two bedrooms villa. The Three Bedrooms Villa has same arrangement as two bedrooms villa with an additional bedroom on the second floor, but each offers more peace and privacy in its. A private swimming pool set in the back garden with a patio, a cool place to hang out and chat, or just simply have a cup of coffee in the afternoon. Offers a wide selections of Indonesian and Continental cuisines made from the freshest ingredients perfected with a scene of swimming pool and beautiful garden as the backdrop. Our specialty is "Rijsttafel Set Dinner/Lunch", even you come alone, you could sample all of the dishes. Open daily for breakfast, lunch and dinner. The Martha Tilaar Salon & Spa Seminyak, Kuta will give you the most relaxing treatment for both your mind and body and set your mind peace and rejuvenated; body treatment, massage, facial, aromatherapy, hair care, manicure and pedicure using Indonesian herbs and spices. A special discount for all service to the guest who staying at Desamuda Village. Desamuda Village meeting facilities is suited for 50 people to hold your seminar, business meeting, or incentives, we can also serve you with with highly personalized service package tailored to your needs and attention to the detail not possible provided by large hotels. We will greet your guest by personalized greetings and comfortable check-in. Perfect venues for dining, cocktails, and theme events are available both indoors and outdoors by the pool and tropical gardens.